Long ago I sat in an undergraduate lecture hall. The course was architectural engineering - steel structures. I sat there reading the New York Daily News. The comics pages or the sports boxes. Usually I held the newspaper up, blocking my view of the professor and his view of me. "You drive him crazy," a friend told me. "Every day he calls on you and asks you some absurd question to see if he can catch you, and every time you give him the right answer, and you don't even really look at him. He just can't handle it." Today I sit in a room with multiple computers, one with multiple screens, and 16 tabs open in Firefox (still Firefox 2, see below). Two are email links. No, three. The television is on. The window is open. Twhirl is feeding Twitter updates to me. I have five things I am writing. All are open in Word or in Google Docs. I've conversed with a student. Had long email conversations with three different people at my university, written about 6,000 words today. Set up a computer. Learned about the Little Ice Age on The History Channel. I've discussed architecture with Rufus and assessment with Dance. Argued the Irish EU vote with friends - no, I guess it was more of an attempted explanation. Watched Germany beat Portugal. Am I the poster child for multi-tasking or the poster child for tech-enhanced ADHD? And therein lies the question. A collection of things came together for me in the past week or so, about attention, about distraction, about the web generation. One of my favorite profs gave me a great article by Dr. Noah Sobe on "The Subject of Attention. ""It is important to note that Montessori understood the child’s "intense attention" as purposeful and not as an expression of involuntary, distracted perception. Her realization that "fixedness" was possible did not, for Montessori, disprove the notion that the child’s attention might also shift rapidly and distractedly. Instead, this stable attention, when placed alongside an observed instability of attention, suggested both a surface and techniques for shaping the individual." Sobe looks at what he calls the "pedagogy of attention." And he looks at the markers we usually use for determining a student's attentiveness, and wonders about that. Then Coffee-on-the-Keyboard (who is my kid) put up a great post on resource discovery. And discussed the way information comes to him and the way he seeks information. One of the things I paid attention to today was his follow-up on Twitter. And I've been relistening to Jack Kerouac's On The Road, and heard a part where he describes what might be the beginning of the phenomenon of "tech distraction" in 1949 or 1950. Dean Moriarty tracking three baseball games at once, one on television, two on the radio. Grad Student Madness brought me to an Atlantic article wondering if Google was destroying our brains. "I’m not thinking the way I used to think. I can feel it most strongly when I’m reading. Immersing myself in a book or a lengthy article used to be easy. My mind would get caught up in the narrative or the turns of the argument, and I’d spend hours strolling through long stretches of prose. That’s rarely the case anymore. Now my concentration often starts to drift after two or three pages. I get fidgety, lose the thread, begin looking for something else to do. I feel as if I’m always dragging my wayward brain back to the text. The deep reading that used to come naturally has become a struggle." The New York Times (relentlessly anti-technology as they are) published a piece on Silicon Valley companies struggling with the distraction of email. Yes, that was classic weak journalism. Of course. It pretends that no worker without a computer was ever distracted, and it accepts statements without links to, or quotes from, any relevant data. Still, it is in the Times, so people will believe it, and quote it. "The fractured attention comes at a cost. In the United States, more than $650 billion a year in productivity is lost because of unnecessary interruptions, predominately mundane matters, according to Basex. The firm says that a big chunk of that cost comes from the time it takes people to recover from an interruption and get back to work." All right. Listen, put me in a quiet room to study or take a test and the most likely product of that will be nothing. Zero. Nil. Nada. Let me loose among my distractions and I can be the most productive guy in town. It is not that I work despite the distractions. It is not that at all. It is that the distractions contribute to my ability to pay attention, to function, to get things done. These inputs collide and contribute to a whole. Perhaps they also allow micro attentional shifts which give my brain breathing space it does not get when, say, a teacher tries to pour a continuous stream of information into me. In this I think of the metaphor of moving through a very dark night. You can not really see anything in the zone you are staring straight at. All that is visible there is dark. And if you turn on your flashlight you will see only exactly what it is shining on - and you will have no chance to see anything outside that beam of light. But if you relax and stop staring you steadily become aware of all the things going on around you. Does all this make me strange? Does it make me normal? Does it require me to avail myself of special educational needs services? I will say this. I sure know that not everyone works best this way. I have a sister whose highest comfort comes from an isolated spot with a book. I doubt she was ever truly happier or ever truly more attentive than the years she spent at university curled up in a corner of the library at Edinburgh reading 17th Century novels and early church history with the dark Scottish day outside. I have friends who range all over the scale between my sister and I. What I know from this is that "the classroom," as we know it, can not work. The perfect environment for study and productivity for one group of students will be poisonous to others. For the past 150-200 years or so we have, as a society, come to believe in a certain paradigm of attention and productivity. Attention means focusing on a single task at a time. Productivity means doing one thing at a time. This made perfect sense in the mills of Dickensian Britain or the factories of Horatio Alger's America. And it made perfect sense when the function of schools was to train pupils, through repetition, to work in those mills and factories. Before the rise of Protestantism was joined to nascent Capitalism and the Industrial Revolution, these concepts did not exist, because the world did not need people who would repeat the same exact task all day long (long boat oarsmen being the exception). In those first half million years of human history multi-tasking was a given, as was divided attention. You needed to be both hunt and avoid predators. In order to hunt successfully you needed to pay attention to hundreds of things. Any subsistence farmer does the same. As does anyone building their own house. As does anyone sailing a ship, tending a flock of sheep, raising a family, cooking a meal, serving as a soldier. In all of these learning/working environments "attention" was what your typical educator or pundit today calls "distraction." It was (and is) far closer to the idea of having 20 windows open across multiple monitors than it is to any activity in the typical classroom. What is the wind doing? What does the sky look like? Does Thor look like he's getting tired? What's moving behind that tree line? What animal left these tracks? I wonder if the dream I had last night means anything? Does this look like our last hunt/sail/mission? We'd now call this "multi-tasking," pretending it is both new and difficult. I'd call it "human-tasking." It is one of the definitions of human operation. Sharks have one thing on their minds. Ants go about their business pretty single-mindedly. Humans take in the world, and assemble what they know through the most complex set of observations. And those observations are additive. If I watch how the students around me in the classroom behave it can actually help me understand everything from history to philosophy to economics. If I watch the rain begin to fall out of the clouds it may help me understand both science and poetry. If I overhear teachers talking I might be better prepared to understand Gramscian definitions of power. Not every person does this the same way. Not every person handles the same quantities of information. There have always been the people who succeeded both ways. Sea captains who needed to handle a million bits of data constantly, bakers who operated with fewer inputs. Those who learned something the first time they saw it at age five and those who, despite the hundred times you've showed them, still can't quite record a television show for later viewing. The classroom, the very structure of school, collides with these facts about human beings. By insisting that students - more-or-less - learn the same things at the same time in the same way, we limit learning in dramatic ways, removing context, removing thinking time, removing space for individual processing, and the option of a differing learning order. This is why technology is so essential in the classroom. (see, you knew that if you stuck around I'd get somewhere) Not because technology is the only way to offer a varied learning environment, but because it is the only way we can do this without tearing down every school building and abandoning our idea of the school day. Technology - computers, mobiles, etc. in all their configurations, linked to the internet - can allow each learner to adapt the school environment to their own needs. Those like my sister can roam the stacks of old libraries and find that book to concentrate on. Those like me can let the world flood in. Resistance to technology is often (see any tech column on Inside Higher Ed or the Chronicle of Higher Education) based in the belief in "gaze." The idea that if a student is not staring at a teacher, they are not learning. That's a powerful belief, but it now seems a historical blip in the history of the human species. 200 years, maybe 400 if you really want to stretch it, out of all the time since we climbed out of those African trees. But technology is actually the humane way. The human way. It lets humans get back to their natural ways of learning. At an end-of-the-semester party, a fellow student who'd sat next to me through seminar after seminar said, "He's amazing, I've never seen anyone work harder in a class. Everything he hears he looks up, then he looks up what that suggests. Then he answers email. Then he emails the class about what he found. Then he looks at a newspaper site. Then he looks something else up." I said, "Wow, you noticed." She said, "It was amazing to watch." See. Neither of us was looking at the teacher. Both of us were learning. I am glad this "multi-tasking" style of learning works for you as it does for some others (including those that have sensory needs and use a fidgit toy). But have you ever thought about how many OTHERS you were distracting? Have you ever thought about how rude it is to not give someone your attention while they are presenting? Would you want someone to ignore you while you were stating your views/ideas? As usual, I find your tips and tools fantastic and I am extremely grateful for your ideas, but you regularly miss the boat when it comes to being considerate to others. I find this happens when some people becoming too self-absorbed in their own mission. Am I misinterpreting your words (as can easily be done in text as opposed to face to face contact) or do you really want our students to only care about his/her needs and not worry about others? Social skills need to be taught to our students just as conscientiously as academic skills. Sorry if this offends, but I get this vibe frequently from your posts. technology allows us to hone in on our interests and helps us absorb and express info re those interests. i can find exactly the people i want to talk to- number one: on the internet, -number two: in a university, -number three: maybe in an honors course (minus math). but in a regular old classroom? what would we have to talk about with each other? we would all be individually buried in our own computer virtual reality. but people who differ from each other in interests/disposition/values etc must learn to communicate with each other if democracy is to thrive. group discussion where each needs to wait their turn to speak can be boring as anything, but isn't that important to fostering a healthy civic culture? Perhaps I'm missing something, but I don't think that at any place in this post I proposed being rude, trampling on the rights of others, or being anti-social. The reason technology can be so empowering is that a student (like me) can visit the world without bothering others. I can whisper to friends (within the class or without). I can run to the library. I can space out momentarily on something interesting. I can listen to text being read to me. And I can do this all without having any interruptive impact on those around me. None of that suggests that I will not interact with those around me. Nor does it suggest (as in the anecdote I used at the top) that I am disengaged from my surroundings. As I tried to suggest - this is additive attention. But, yes, Trixie - I do know that there are children who may not be cut out for a Montessori-type environment - a place filled with movement and noise and action (although I would urge you to read the linked paper on this). Just as I know that there are (in my opinion far more) students who do not learn best while sitting still and being quiet. Perhaps one of the very first social skills we should learn is acceptance of real diversity. Not the diversity of what people look like, but the diversity of human action and human experience. Perhaps one of the first social skills we should learn is to not impose our needs on others - but to find ways to allow each other to reasonably operate in our own way. So, if you have the school space, the funding, the staff, I think we might see three or four radically different experiences available at every age group. The best primary school I have seen in the United States was a quiet little Midwestern suburban school with students who came equally from million dollar lakefront houses, impoverished trailer parks, and 1930s factory worker housing developments. Within the school there were fairly traditional classrooms K-5. There were also two year looping classrooms. And there was a wildly chaotic, 120 student and 5 teacher first-through-fifth grade multi-age classroom (which already featured a lot of individual technology stations). That school not only had the happiest kids I've observed, it did as well as any school in the state on standardized tests. So that's my model. Choice. But if your school lacks those choices, the way to create them within a single classroom is through technology. The technology protects both sides by allowing individualized environments. That does not mean that technology stops face-to-face interaction. It surely won't stop face-to-face student-to-student interaction nearly as much as, say, a test does. Or silent reading does. Or listening to a lecture does. Or working on homework individually does. But it does give significant environmental control to the student. I know that is threatening to many teachers, but I also think that learning to control one's own learning environment might be the single most important skill we can teach in schools. Ira's friend/classmate also said: "YOU drive him crazy," a friend told me. "Every day he calls on you and asks you some absurd question to see if he can catch you, and every time you give him the right answer, and you don't even really look at him. He just can't handle it." Vera says: therefore Ira didn't mean to be rude, and i'm sure after his friend informed him that he was making the professor crazy, he stopped the newspaper thing out of consideration for the professor's feelings. you are advocating students controlling their learning environment, which makes learning more fun and less frustrating. in addition to that, though, students should be GUIDED in dealing with people different from them- and that CAN be frustrating when you put a lot of different kinds of learners together and have a discussion. students probably aren't going to choose to be frustrated, but, just cuz it's frustrating doesn't always mean its bad. students need to learn patience, to really listen to and try to understand the other person's point of view, etc. those are skills that allow us to learn from each other, have compassion for each other, realize our common ground, etc. So i believe i'm not disagreeing so much as adding another important emphasis that i don't see in your classroom examples. hey, if you write a book about your life and put it out there, you gotta expect this kind of dimestore layman gratuitous analysis. Your analysis might have (more than) something to it. Many others simply say that I fail in almost every attempt at eye contact, and that could be analysed too, there's all sorts of things hidden in that problem. Either way, perhaps the more important thing, from a school perspective, is to analyse the prof - who I loved and who remains as one of my favourites. What was driving his need? He needed me to be looking at him. Now, I was not making noise. I wasn't interfering with anyone else's learning. (The room had fifty people in it scattered through an auditorium designed for 300-400 - I wasn't blocking anyone's view.) I was, as he constantly proved, attending to the course material. But what he needed was a specific form of gaze focused on himself in order to feel comfortable. I ask because both my observations and a flood of research indicate that teachers find all sorts of student behaviors to be "rude." Not staring at the teacher (an attention form most prevalent in White Protestant and East Asian cultures) is considered rude. Needing to stand rather than sit is considered rude. I've had my laptop/literacy software considered rude. Standing too close to someone is considered rude. Standing too far away is considered rude. There's a mountain of evidence suggesting that simply being African-American (particularly male and African-American) is considered "being rude" in many schools. So, the question becomes (I think), how do "both sides" negotiate this. I usually say to "ADHD" kids - sit near the door so that if you have to leave (and I think they do often need to leave) you can do it without bothering people. Or, if you have to stand up stand up in the back corner where you won't be in people's way. Or, bring something small and "acceptable" to fidget with, so you're not drumming on the desk. Or, if you have 13 tabs and windows open on your laptop know which ones to usually hide (discretion being a valuable skill). Or simply, you know how to set that mobile on 'silent,' don't you? But all that social skill training is defeated if the teacher says, "you can never leave," "you must stay seated," "put away that computer," "stop playing with that pen." When that happens the teacher is announcing very clearly that his or her needs trump all others and that this is an issue of power and control, not people learning to live alongside one another. And when the student hears that, they will either rebel openly or just give up. Anyway, you've suggested a whole post here. I'll have to get to work on it. if my analysis is correct and there was some passive aggression in your actions, than the aggression part seals the deal that you were being rude. if you knew that the professor was being bothered, but you didn't bother to make the effort to negotiate/communicate with them about it cuz you could care less, that is being rude. outside of those two possibilities, you were not being rude. rather both of you were being clueless. more later. goin fishin at the moment. I'd suggest that both the professor and I were being clueless to some extent, rude (though probably unintentionally) to some extent, and third thing - self-protective. Often what is being perceived as rudeness is self-defense - particularly in a classroom where one culture is typically being imposed on another. The rebellious actions are indeed "rude." Ghandi wouldn't wear proper clothes. The Jews in Palestine threw bombs in marketplaces and blew up British hotels. The Irish consciously resurrected a language that their Brit leaders could not understand. But these were all, as I think you said at the start, attempts to say, "look at me as the person I am." They were self-defense strategies, and they are very similar to those used by students who do not wish to become so weak and compliant as to lose all sense of self-worth. Of course if communications line had been more open, had power been more negotiable, rather different strategies might have come into play. I'd guess that the same thing applies in the classroom. If power is truly distributed and flexible, if communications lines are truly open on something approaching equal terms, students will negotiate rather than rebel or resist. "Technology - computers, mobiles, etc. in all their configurations, linked to the internet - can allow each learner to adapt the school environment to their own needs." This summarizes the wonderful potential of technology to support diverse learning needs in our badly flawed school system. It is sad that so many teachers at all levels continue to regard the essential and constructive learning strategies of some learners as inappropriate and unacceptable behaviour. So many teachers seem incapable of comprehending learning needs and learning styles that are different from their own that I'm often tempted to despair. The prospect of removing this barrier to learning seems remote in the extreme. But then again, no one could have anticipated that the Berlin wall would crumble as it did, so perhaps there is even hope for our classrooms. paul and ira- we have to differentiate between students who are minors, who are forced to go to school, and who legally have less power; and students who are adults, who have certain rights minors don't, and who choose to go to a university course. it is sad when teachers of minors "continue to regard the essential and constructive learning strategies of some learners as inappropriate and unacceptable behaviour" because unless the minors have good advocates in their parents, they are out of luck with a teacher who doesn't want to listen to what they need. adults are not at the mercy of a university professor the way a minor is at the mercy of a teacher. ira should have spoken to the professor about his learning strategy after his more tuned in friend told him of the professor's frustration. the professor needed to be educated. i find ira's parallel too extreme for the university setting where a paying student has the power to research what a course and professor are like before choosing that course. the university student is not powerless in any comparable way to the colonized. the metaphor is helpful for minors who don't have good parent advocates. ira, perhaps you are carrying over habits of passive resistance that are no longer appropriate now that you are an adult with access to many more choices and resources than when you were a minor? sometimes old habits are hard to break. at the very least you could have talked to the professor. i have the luxury and the pleasure of only teaching 6 ELL students at a time. my own learning style is that i must be given many opportunities to talk when i'm learning something, otherwise i need to braid my hair as i listen or doodle or take notes which help me focus, but which i will not attempt to keep for later review. in my classes, if students are like me, they need to doodle and talk a lot about what we are learning. i also have a student who likes to walk around or at least stand up when we have class. other students need to be doing something with their hands like feeling how the gears of the old pencil sharpener sitting on my desk work, or taping something together, or whatever. i let them do what they're comfortable with, but will also periodically check to see if they're paying attention, ie call on them to participate in some way if they are just listening/fiddling. sometimes if more than one student isn't paying attention, i have to adjust how i'm teaching, meaning that i'm boring too many of them. in a large class the teachers might be nervous about losing control, being perceived as not being respected, which can lead to a loss of control, so they don't give as much freedom. as i posted a few weeks ago, teachers need to SEE a class where kids have more freedom and it doesn't lead to chaos. paul did give one example, which i am thankful for. ultimately, whatever helps the student be happy and comfortable in the classroom is going to help them learn- and this is the goal of every caring teacher. when teachers see that giving more student control/choice in learning strategies will lead to happier students who learn more, caring teachers will change the way they teach. as for the others- that's the evil of tenure. Not sure why my last post didn't make it here, but I will try to remember what I wrote. I agree with most of the comments posted but disagree with others. My main disagreement is with my or other's perception of rudeness. Reading a paper or emailing someone while someone is presenting or teaching is just plain rude and disrespectful in my books. I constantly make reference to my students about the impressions and connections that we make with others, and not focusing on someone on when they are talking gives the impression of superiority whether you mean to or not. I agree, technology is the key to increasing accessibility but with it comes responsibilities. It is used for learning, not recreation, in the classroom. My analogy is the good ole pencil and paper. It can be a very distracting tool if allowed to be. If students are writing notes in class, they are not engaged in the process and, contrary to Ira's opinion, very distracting for many others. This comes from one ADHD student (me) who could tell you every child in class that wasn't paying attention in because they were distracting me! Even more frustrating was when I had to work in groups with these kids who had only the "reader's digest" version of the instructions (enough to reply smartly to the professor on demand) but not enough to know the specifics of the task. Obviously I don't condone boycotting pencils and paper, I just think we need to continue to teach the etiquette that goes with being, living and learning in a group. I have students in my class using all sorts of different tools at one time and the others in my class are not distracted at all - unless the child is not using the tool for what it supposed to be used for. One child the other day thought he would try out a game of solitaire during a group project and the other kids were on to him like white on rice. And no one had even seen the screen! They could just tell by his level of engagement. I have found this discussion very enlightening. Thank you everyone for your candor. A couple of thoughts, because it has been a great discussion. "adults are not at the mercy of a university professor the way a minor is at the mercy of a teacher." I think this is the opposite of what I have seen. In my observations at a half dozen post secondary institutions I see far less flexibility from faculty than I see in primary and secondary schools, and I do not see much in the way of real student choice. Yes, of course, students can choose not to show up, but most course syllabi are extremely rigid things, most post-secondary faculty feel strongly that they get to choose instructional methods, and only a very small percentage of students - because of finances and geography in the US - have real choices. In addition universities and community colleges have very intentionally grabbed a stranglehold on credentialling for careers that does indeed put students at the mercy of the faculty. I'll also have to do a post regarding attempts - at the post secondary level - to discuss my learning needs with university professors. I can count on one hand the number of times that has gone well. I know that this is not an uncommon experience, for the college drop out rate for these "different" students is monstrous. Trixie: I am not discounting how you feel, but I think that we need to be aware of how culturally determined those school definitions of "manners" and "rude" are, and how they are designed to give one group access to success at the expense of other groups. As I have travelled and lived various places in my life I have often found "manners" to be so radically different, it amazes me. But in far too many classrooms one culture - one learning style - one attention style - is favoured over all others. Who makes that decision? Why is it made? Is a culture wrong because it believes in community cognition and communal literacy? Does the student who needs music to focus have fewer inherent rights than the student who needs silence? Does the Protestant Church model of attending to a speaker trump other cultural norms automatically? My argument with you is that you seem to favor one side - or perhaps that's the wrong word - you seem to be more protective of one group than the others. Perhaps, to you, I seem to be doing the same thing - but for a group that is not your group. This is the problem with the very idea of industrial education, it encourages the pretense of a "norm" - and then enforces that. The solution is to develop learning spaces which accept/permit the real range of human learning styles - and which might even accept the idea that a student comfortable and paying attention 50% of the time is in a better place than if he/she was uncomfortable 100% of the time. Because being uncomfortable means 100% of attention is focused on the discomfort. 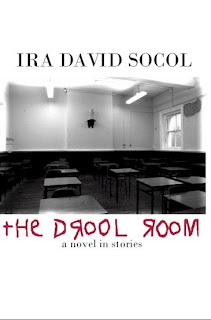 ira, super super book (the drool room). i finished it in one shot. you have the drive of an artist, which is why it is amazing to me that you had all that drive to express yourself inside of you, but didn't start writing creatively until relatively late in life. i'm wondering how you got started writing creatively and how that has changed you. maybe that could be a future post. i see your point about inflexibility in secondary institutions- you've persuaded me. lots of work to do for all of us interested in helping students unlock their potential. Thank you so much. It's funny, I did do writing (non-fiction journalism) and I did creative things (art and design) but it took a very long time to start to trust my own creativity with words. Part of that was that it took a long time to build up a real collection of things I had "read" - literature I had experienced. And part of that came from a distrust of the stories I wanted to tell (people around me had 'not been listening' for years, so why would anyone want to read). I think it should be a post. Because it is all part of the "un-mute" process. When teaching becomes 'all about the teacher' it fails. People are not robots. Teachers are not perfect. The problem is that universities teach teachers how to teach that is have command of the classroom see the learner as passive. Guess what - this is why some teachers teach only to feed their own ego.